Damn it. Just, man. 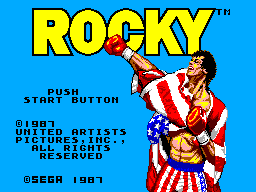 Rocky was a game I couldn't wait to play. Two years ago my brother and I were obsessed with the movies and watched them constantly for like the entire summer. Why, I don't know, but there was something about laying on the floor with one's eyes closed listening to the dialogue. Anyway, before I purchased my SMS, I heard about this game and thought, awesome, I wonder if it's the same version they were supposed to release for the NES. I hope it wasn't (this game was never released incidentally, this version is probably why). My brother is a boxing nut, so I figured why not feed his insanity for boxing games with this little beauty? Outdated medicine goes down hard, my friends. Terrible, some of the worst ever. It is based generally on the first four movies. You face a contender, do a practice drill to get better (these are necessary to win), and then face another one. Pretty cool, you'd think, except for the fact that there are only THREE contenders. Yep, that's it. There are so many other characters in the Rocky movies that could have been used. I mean, yeah, I know he only fought like three people, but still, this really needed some variety. And, more importantly, they go from incredibly easy, to incredibly difficult, to soldier of satan. It's just terribly impossible. They could have done so much more with this. 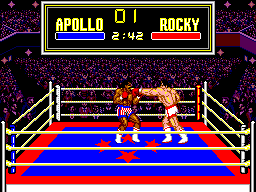 You first face Apollo, and basically have to just keep pressing the attack button and he's down in like a round or two. Before this, you have to hit the speedbag. Get it to like 8 hits per second and you'll fight better against him. Then, you get to hit the heavy bag, which is easy, and then go on to Clubber Lang who just comes at you and tears you apart. Any fun you had before you went against him is completely shawted. You can beat him with repeated body blows, so it's not THAT hard, but you start to get a bit edgy at this point. Then you get to play around with Mighty Mick and hit the hand pads. Pretty simple, just keep the controls going from left to right and blah blah, and you'll do fine. 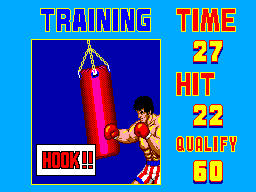 I think you have to get over 70 hits or so to get better skills Not like it matters, because then you go against Ivan Drago, who will just ruin you love for the SMS. I hate this game, I just hate it. There is no room for learning or mastering techniques, you just end up pounding buttons. When you get to Drago, if you do, you pretty much have to do the same combination over and over, dodging his same movements over and over. It takes forever and is hardly worth it. The graphics were nice, very well done. Strangely enough, they are almost identical in style to James Buster Douglas Knockout Boxing, Heavyweight Champ, or George Foreman's KO Boxing. Looks like they just did it over and over again, in fact. Interesting. Still, they're good. Hmmmm, this could have been better. The music is generally lame, though fitting, and the sound effects are weak. It sounds like you're swatting at gnats when you punch. A hard, knock-down strike sounds like a garbage can tumbling over. It's a shame. The controls are responsive, I'll give them that, they're just terrible. Though you know what each movement and button does, it never seems to work correctly. However, this is a problem with the gameplay itself, and not the controls, so I won't judge this part too harshly. I have yet to even want to try this again. I remember my brother uppercutting (no joke) this game out of the Power Base because he got so pissed off. I'll be surprised if you don't as well, it's just a terrible disappointment that could have been so much better. In a way, it was foreshadowing Stallone's career I suppose. Just don't even bother. The only reason I have it is to say I have it. In addition, it's a good way to get myself pissed off if I so feel the need.